Founded in the year 1897, the Bindeballe Kobmandsgard boasts of an annual footfall of 100000! It is a museum that features collections of traditional commodities from olden times including old store signs and interiors. More than 5000 different items are on display. 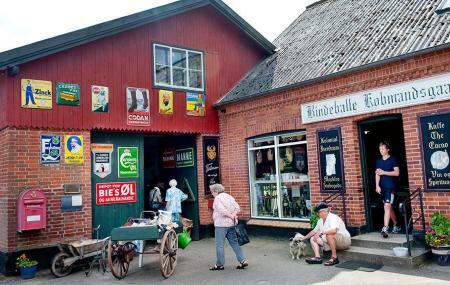 The Bindeballe Kobmandsgard is also an actual general store where you can buy local specialities. How popular is Bindeballe Kobmandsgard? People normally club together Lalandia and Skulpturpark while planning their visit to Bindeballe Kobmandsgard. Very nice location, a must for everybody! Here you find everything, also a very nice area for coffee and cake. Many greetings from Austria, it was a pleasure to see that amazing house. Quirky little shop, off the beaten path. Plenty of oddities and rarities to see and buy. Parking is somewhat limited, as is wheelchair access to certain areas of this business. Nice and charming place. Shop-museum with many old items from our childhood (maybe more from childhood of our parents). Behind shop nice picnic-place with playground for children. Quiet and green. We would come back here in the future. A step back in history. A must if you are touring in the area.